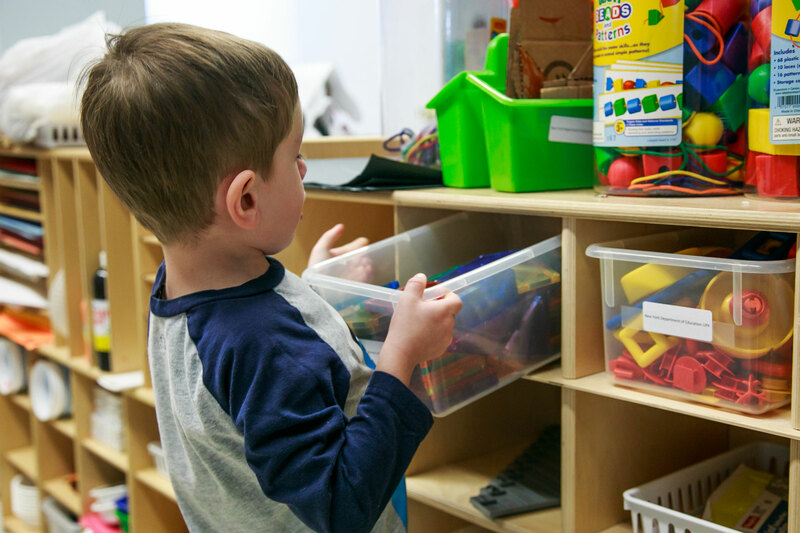 JCC Brooklyn – Windsor Terrace Preschool Program focuses on children’s development in a warm, loving, play-based environment. For those just beginning school, we support the transition to separate happily from favorite people (you!) and develop trusting relationships with teachers. We love our littlest littles and keep them giggling and smiling. We send pictures daily, and keep lines of communication open – there is no question too small about your child! A driving principle behind the Bank Street philosophy is that children can become lifelong learners by interacting with the environment around them, including other people, different places, and various things, and then interpret what they’ve just experienced. Students are offered myriad opportunities in which to do this—blocks, dramatic play, puzzles, field trips and sensory experiences. This is the 2nd school year that Iris has been in your school. When they were in the Shining Stars class together the teachers became a very important part of our family’s support system. They have supported us through many developmental stages with Iris. The teacher always followed our lead in things and maintained continuity between home and school. The assistant teacher is wonderfully caring and has great intuition when dealing with the children. If we could take your teachers with us through Iris’s whole school career we totally would. They have been so wonderfully instrumental in developing Iris’s self-awareness and emotional control. Thank you for allowing us to have them in our lives. Iris will miss them both. Teachers are amazing! So much love, family communication and family involvement. We feel so lucky that our daughter was able to have such an amazing experience. Since children learn and evolve at what seems like lightning speed, we make sure to document their work every day so that you can see the progress your child is making firsthand. You’ll be seeing the stimulating and fun projects that we work on when your children bring them home to you. We create folders for the kids and take many photos during the day so that you can glimpse the fun that we are having learning, playing, and exploring. At JCC Brooklyn- Windsor Terrace, we have an outdoor playground where the children engage in cooperative games and free play. Prospect Park is only few blocks away and we take advantage of it by going on nature walks, having fun at the playground, enjoying being by the lake and learning about the many plants, birds, and animals that share our world with us. For information about applying visit our admissions page. Contact Ilona for more information at 718-407-6377, or email windsor@jcc-brooklyn.org.